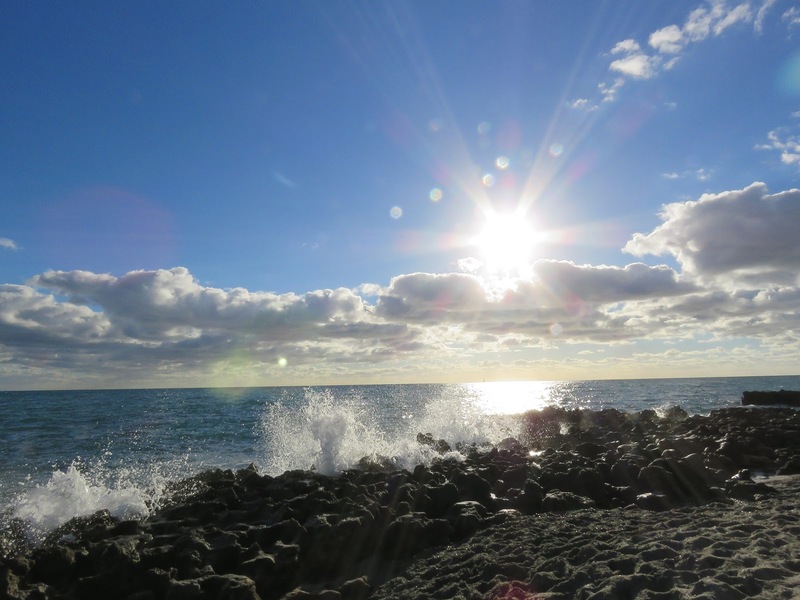 These are images from our 2nd visit to the Blowing Rocks Preserve. We went to this preserve (hubby's favorite) 3 times and each visit was great. On this visit I watched multiple groups of Brown Pelicans flying by and in the ocean I saw some dolphins swimming by. It was a beautiful day and a lovely skywatching day too. This visit hubby tried to make sure the tide and winds were just right for the crashing waves on the rocky shoreline. Thankful and grateful, for today and every day! These are some cute Sanderlings. I think the lighter colors mean these are juveniles? I am thankful for the simple things and pleasures. Wow, great photos! This looks like a lovely place to visit and walk around in. I loved the silhouette photo of you and your husband. Wonderful splash of waves and pretty sky view to go along looks impressive. Great capture on the pelicans symmetric flights! 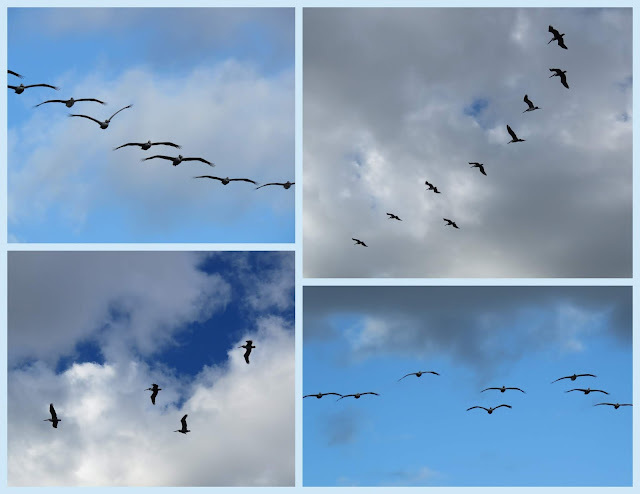 Your collage presents wonderful captures of birds in flight. Love the earthy nature of some of your shots! Lindas e belas fotografias, aproveito para desejar a continuação de uma boa semana. Wonderful beach shots...and love the dolphin! When I saw Blowing Rock, I immediately thought of the one we have in North Carolina, which is mountainous! Looked again and saw you were at Rocks! Thanks for commenting on my blog. Happy Day back to you! ...nature's beauty, something to always be thankful for. No wonder your husband likes this place so much, Eileen! Love the splashes of water. I love your shadow shot...SO CUTE! And it's so exciting to see Dolphins and HARD to get photos of them! I end up with a dozen or more of a ripple in the water! lol Love the waves crashing. You don't see that much here in Florida! Enjoy your afternoon! I'm supposed to take a day off from hiking...we'll see how that works out! haha! What a fantastic place to be with camera in hand! Eileen, your shots are absolutely stunning! Lucky you! Wow, the waves are gorgeous, and the birds and dolphins are beautiful, thanks Eileen. So true! Embrace every experience! Wonderful nature photos. 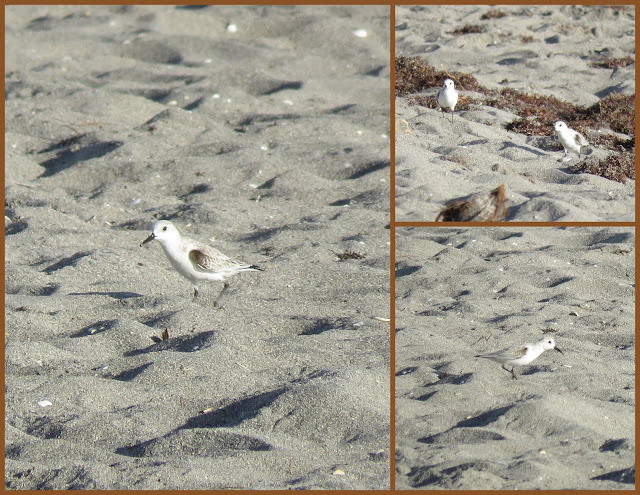 I think you are right - the sanderlings are probably juveniles still in their winter coloration. Lovely shots, we have a white pelican here in Iowa.They are unique birds to watch. Wow! What glorious sights you saw. Love the grand splashes the waves made. All the pelicans, Sanderlings and dolphins you got to see and take photos of added the cherry on top of your great wanderings. Love the shadow shot, too! Happy Thankful Thursday to you! Beautiful! And we don't see dolphins in these waters - what a treat! These views are lovely. Also nice to see your shadow shot. Thanks for linking up today and have a great weekend. I see much for which to be grateful in these gorgeous images. I love each and every one. Another wonderful place to visit! I love watching and capturing the crashing waves. Nice pictures of waves and birds! Wow! you beautifully captured the dolphin. What a lovely day to be out at the preserve and enjoy what Mother Nature shares with you. I've never seen a brown pelican before just white ones. They are one of my favorite birds. Nice shot of the dolphin, maybe you'll have better luck next time. Thanks for sharing these wonderful photos, Eileen and have a wonderful day. Those wave photos are spectacular! It's the wave action that really caught my eye! Wow your pictures are just beautiful. Beautiful images! The dolphins are so cute. Beautiful photos. And I appreciate the tone of your post today; I needed to hear that I am blessed and grateful for everything. Beautiful pictures.... especially the first on....so bright and clear..good shot of the Dolphin..I use the sports setting that I have on my camera..It takes several continuous shots, then I pick the one I like..HaHa..me telling you about photography..sorry..
Nice splashes!! Your dolphin is much better than my manatee attempt. What a beautiful location. I can see why it's a favorite. Beautiful sky shots! You know the simplest pleasures are the best. Great shots. I love watching brown pelicans fly, they are so graceful and coordinated in their flying and their are very striking when perching. My favourite is the first picture. I like the wave splashing against the rocks. your images are incredible today eileen, the first one, wow!! how exciting to see the dolphins, we see them here frequently in the summer and it is always a thrill!! What a glorious sunny day you had or that trip out and your photographs show the place and critters off well. I hope you have a lovely weekend. Beautiful pictures of the splashing water and nice to see the dolphin. Love the splashing waves, enjoy the weekend. Beautiful pictures of nature, it must be great to photograph there. The dolphin is really great. You picked a great day for your trip Eileen. The sky shots and the waves crashing on the shore are simply brilliant and also very clear. I think the Sanderlings are still in their winter plumage rather than the browns and golds of summer. Great sightings at the beach Eileen, enjoyed the birds and the dolphin and that first shot was amazing. Splendid photos! Wow great photos. Favorite is number 1. Beautiful captures all! Happy weekend! What a beautiful place. Sometimes I miss the beach. We really have to get to that beach/preserve. The wild water reminds me more of the Oregon Coast than the beaches we see in Florida, which seem rather tame and calm to us.